/ How do I buy a book on my Amazon Kindle? 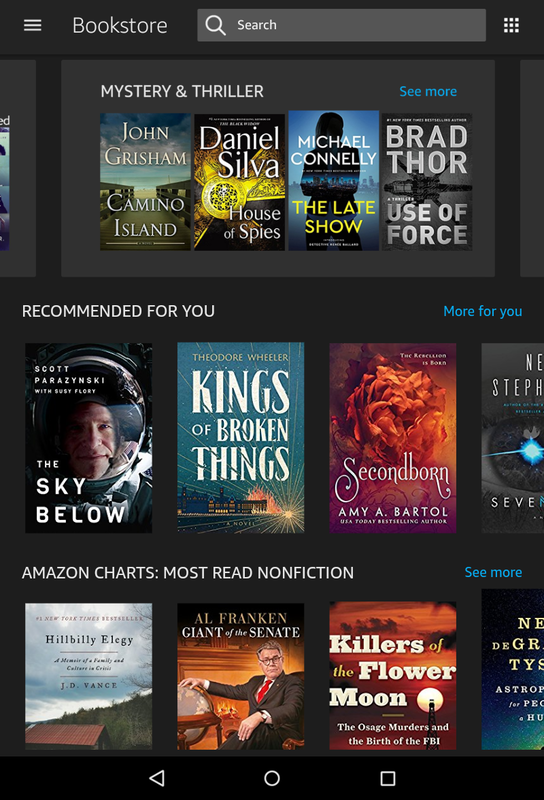 While Amazon has put great effort into making the process of exploring the Kindle Store easy and the distance between finding a book you want and reading the first page of it is a mere two taps and some time, it still isn’t entirely obvious how to proceed. While some of the earlier, budget Kindle devices with the eInk screens work with the cellular network known as “Whispernet” (you don’t really need to worry out it works, of course) the more modern Kindle units like the Fire HD actually need a wireless or Wi-Fi connection. Fortunately, there are lots of wireless Internet connections out there, including at your local Starbucks. For this demonstration, I actually went to Starbucks and used their Internet connection. Free with purchase of a cup of coffee, so quite a good deal, really! Any book with the checkmark on the lower right is one I’ve finished. Others have percentage complete on the top right, and some, rather confusingly, aren’t at 100% but are marked as finished. Notice that I’m slowly download the Black Panther graphic novel in the top left slot too, to read once I’m done with The Man of Legends. Not interested, just want to buy a book? No worries, tap on the blue “Not now, continue to Kindle store” that’s smack dab in the middle of the screen. Now you’re finally in the Kindle Book Store! Sounds really cool, but…. it’s not the book I want to read today. Master of Formalities by Scott Meyer. Now, let’s look closely at this page so you can ensure you click on the correct button. Notice first that you can get a sample (usually the first chapter) for free. Handy! Tap on “Download Sample” and you can give it a spin before you commit to the purchase. 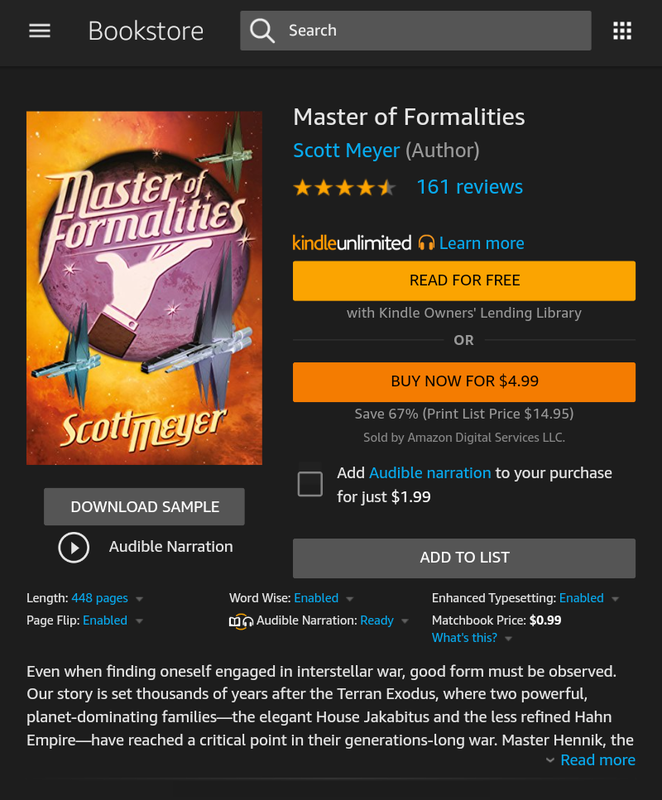 This is also part of the Kindle Unlimited program so if you were a member, you could get this particular title for free. Not too bad. Not a member? Me neither. The orange button in the middle shows the price: “Buy Now for $4.99“. That’s not too bad for a 448 page book (look very closely just below the cover art, it says “Length: 488 pages”). I also pay attention to reader reviews too, and 4 1/2 stars out of five is impressive. This is going to be a good book! I’m ready to buy it, I am, so I will tap on “Buy Now for $4.99”. Want an audio narration too for when you want to rest your eyes but keep progressing in the book? With this title it’s only an additional $1.99: Just tap to check the adjacent box before you tap the Buy Now button and it’ll be included automatically. 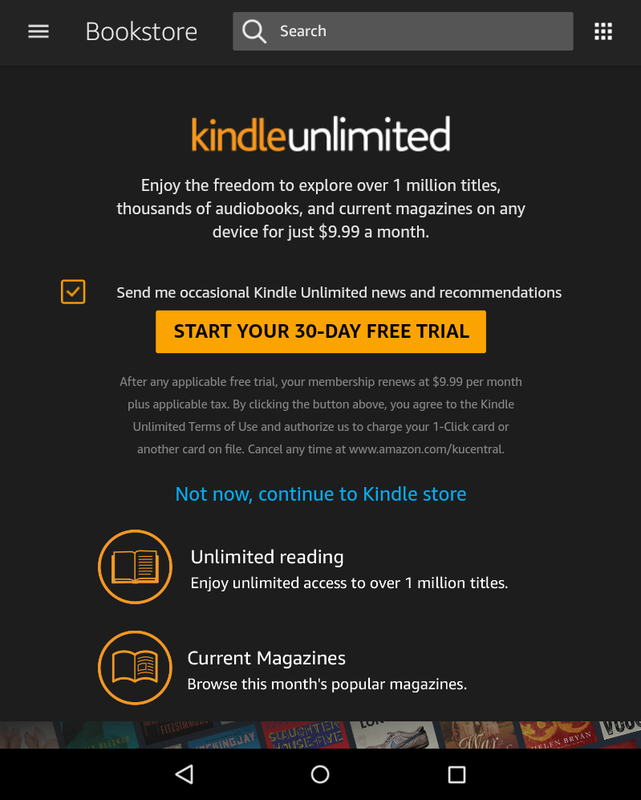 It’s important to point out that every Kindle is automatically tied to an Amazon.com account, so yours might well be connected to your daughter’s account. You might want to check with her before you go crazy buying tons of books, but there’s definitely no “enter credit card” step here. 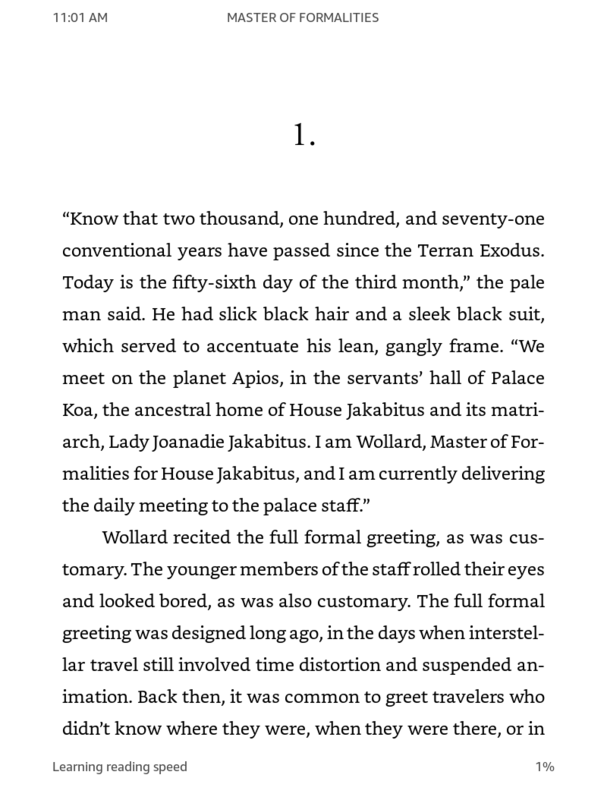 Ah, that darn Black Panther is ahead of the new Master of Formalities in my download queue, but the Kindle Fire is smart, it’ll actually pause the current download, grab the new book, then go back to Black Panther. Exactly what I’d want it to do. 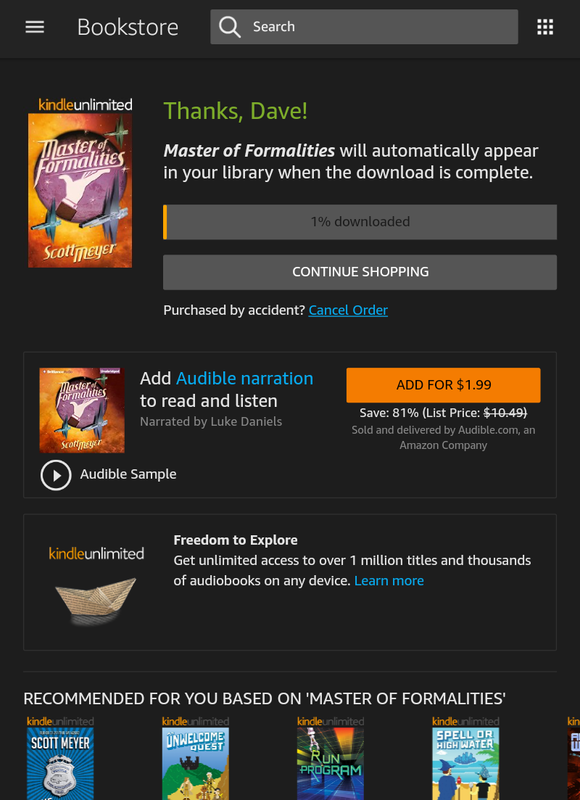 Since you don’t have to finish downloading before you start reading, it’s just a matter of a few seconds before I can tap on the new book’s cover art and start reading! That’s all there is to shopping for new books for your Amazon Kindle Fire HD or other Kindle. Quite easy, actually, and there are millions of books available, so I’m sure you’ll find at least a couple of titles worth reading along the way!